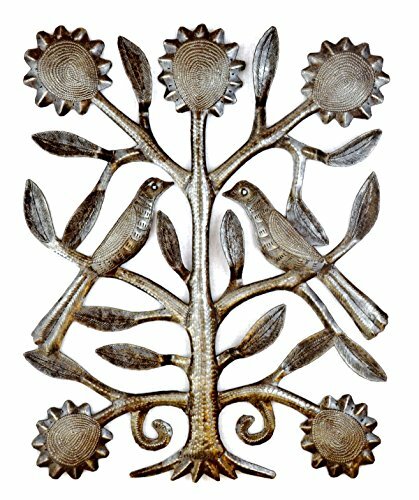 The birds in this tree of life are ready to fly! 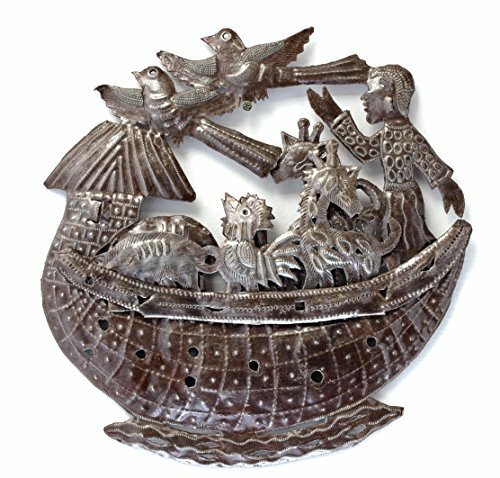 A wonderful piece of hand-crafted folk art that transcends many decorative styles. 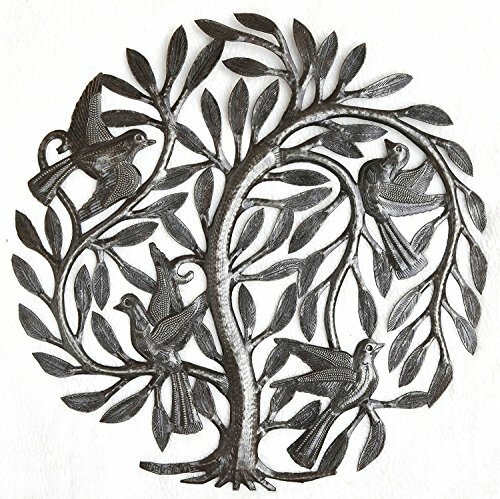 A tree of life is a universal symbol which unites the earth below with the skies above. Size: 15" X 15"
Two trees crossing can be symbolic of two lives intertwining. A lovely, meaningful gift idea for an upcoming anniversary or wedding. Signed by artist Samuel Brutus. 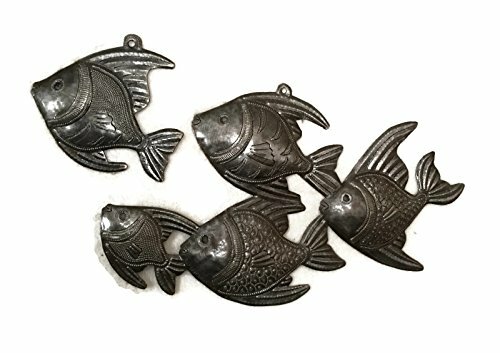 Size: 15" X 15"
Talking with Fish, Mermaid, Artistic Haiti Metal Steel Drum Art 17" x 10"
Noah Ark Wall Sculpture, Metal Wall Art, Fair Trade From Haiti, 15" X 15"
The traditional Haitian method of creating metal sculptures from discarded oil drums has changed very little since the technique was first developed by Georges Liataud in the 1950's. To begin, the drums are burned out, cleaned up, sanded down and pounded flat. 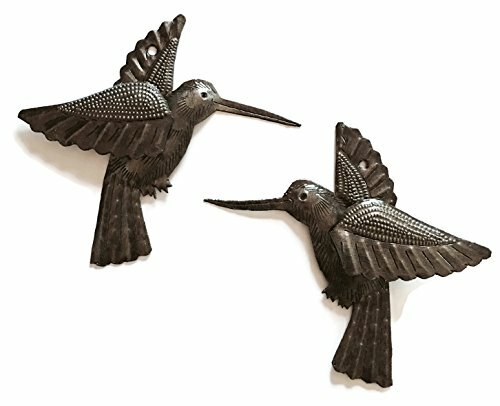 Next, the artist chalks his intended design onto the prepared metal and begins the heavy and tedious work of cutting and detailing, using only a hammer and chisel. Finally, the sculpture is sealed with a weather-proof finish, so that the sculpture may be displayed easily indoors or out.Hanging your art is easy once you know how. 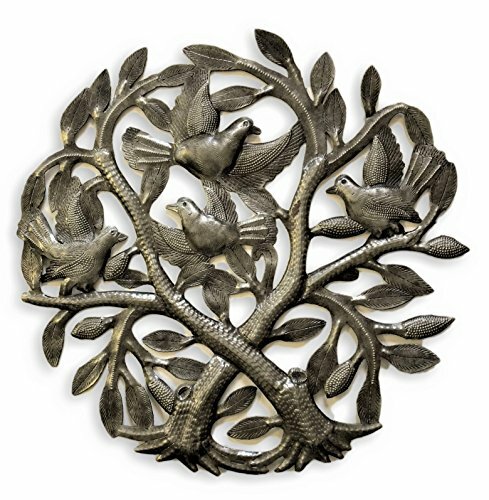 Choose a point where the design element is joined or notched and use a nail to hang it from that point on the wall. Use a second and a third nail (if necessary) within other design elements to straighten and secure the piece. Then stand back and admire your work. You'll see that the nails "disappear" into the sculpture. Beautiful! Though your sculpture comes with a protective weather-proof coating, it will wear off over time outdoors and rusting can occur. You can prevent this from happening by spraying on a clear enamel coating. Once a year is plenty. Now, how easy is that? 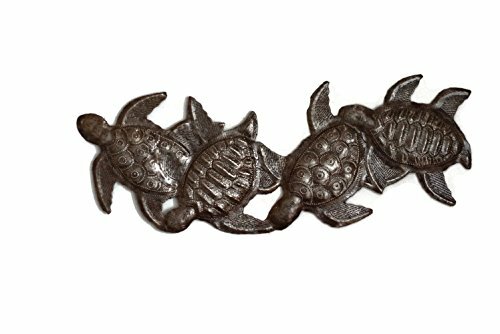 Sea Turtle, Metal Wall Art, Handmade in Haiti, Steel Drum Art 6" X 17"
All it takes to hang this metal sculpture is a few nails and a little know-how. Here's the know-how part: Place the first nail within a closed or notched design element and hammer it into the wall. Using a second and even a third nail - if the sculpture is large - to straighten and secure the piece. Then, stand back and admire your work. That's it! Though it is protected with a weather-proof finish, this sculpture will rust over time, if exposed to outdoor weather. To prevent this from happening, grab a can of spray on enamel at the hardware store and go to it. Once a year should be plenty. It's a snap! In the village of Croix-des-Bouquets, Haiti, the air rings with the sound of metal banging against metal. Workshops line the streets of the village and outside each are stacks of discarded 55-gallon drums awaiting transformation. To begin the process, the tops of the barrels are removed and the open barrel is stuffed with straw and dried banana leaves and then set ablaze. This burns out the residue and old paint and strengthens the metal. After the barrels have cooled, they are slit down the side, pried open, pounded flat and sanded down, giving the artist a smooth flat surface, much like a painter's canvas. The artist chalks his design onto the metal and then, using a hammer and chisel, begins the work of cutting the sculpture and giving it form, detail and dimension. When he is satisfied with his results, he pounds his signature onto the sculpture and seals it with a protective, weather-proof finish. 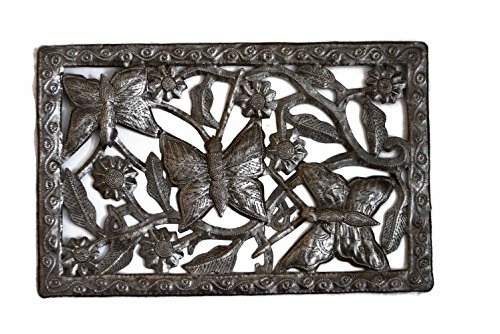 Artistic Butterfly Garden Wall Art, Haitian Metal, Recycled Oil Drums, 11" X 17"
This metal sculpture is meant for display indoors or out, but if you choose to display yours outside, be aware that the protective, weather-proof coating will wear off over time. 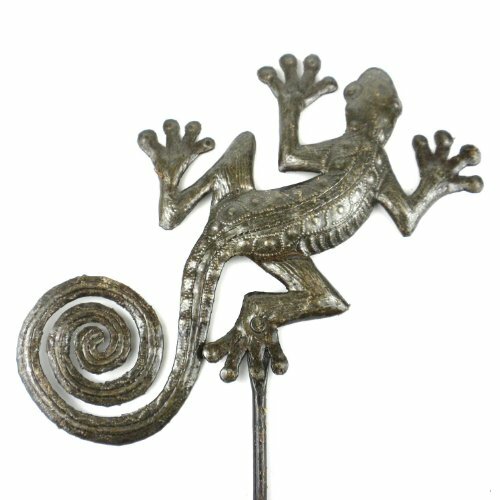 To keep your sculpture looking just like it did the day you bought it, take five minutes once a year to apply a spray-on clear enamel coating.A few nails and a hammer are all you'll need to hang your sculpture. Look for a place where the design is joined or notched and put the first nail there. Use a second and possibly a third nail, if the piece is large, in other joined or notched design elements within the sculpture to straighten and secure it to the wall. The nails will "disappear" with the piece. 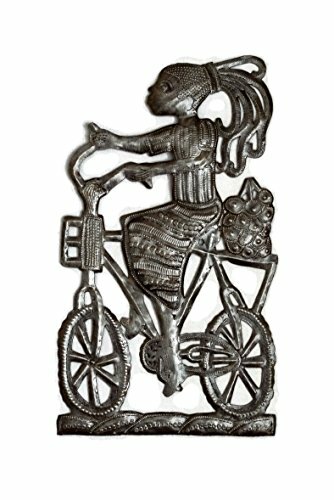 Simple as that.In Haiti, the traditional art of converting oil drums into sculptures is a true mark of both man's imagination and his resourcefulness in the face of dire economic circumstances. Using 55-gallon oil drum cast offs, the artist first removes both ends of the drum. Next, he stuffs the drum with straw, igniting it to burn out any residues. When it has cooled, he slices it down one side and pounds it into a flat metal sheet . 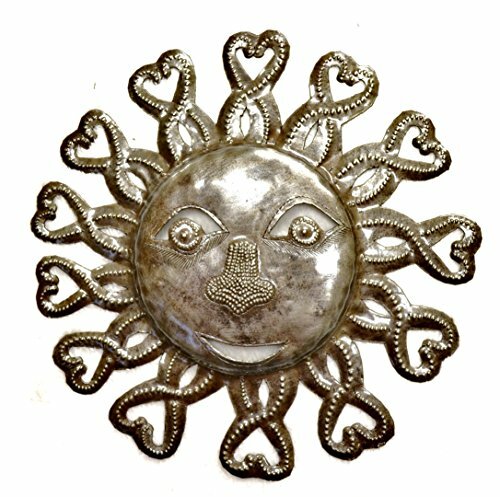 With a stick of chalk, the artist then draws his intended design onto the metal. Finally, he applies a hammer and chisel to the task; cutting, shaping, and contouring the piece to its completion. 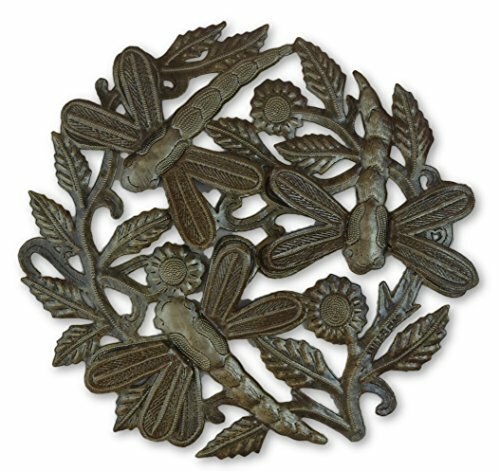 it's cactus - metal art haiti Dragonflies, Haitian Tranquility Metal Garden Art, Recycled Oil Drums,3-D Art, 12" x 12"
All it takes to hang this metal sculpture is a few nails and a little know-how. Here's the know-how part: Place the first nail within a closed or notched design element and hammer it into the wall. Using a second and even a third nail - if the sculpture is large - to straighten and secure the piece. Then, stand back and admire your work. That's it! Worried that this sculpture may rust? Don't be. A weathered patina isn't necessarily a bad thing, but if that's not the look you're going for, take five minutes to apply a spray-on clear coat enamel once a year to keep your outdoor sculpture looking the same as the day you bought it.The center of Haitian metal sculpture is the village of Croix-des-Bouquets, where the clanging sound of hammers striking chisels is a constant music. 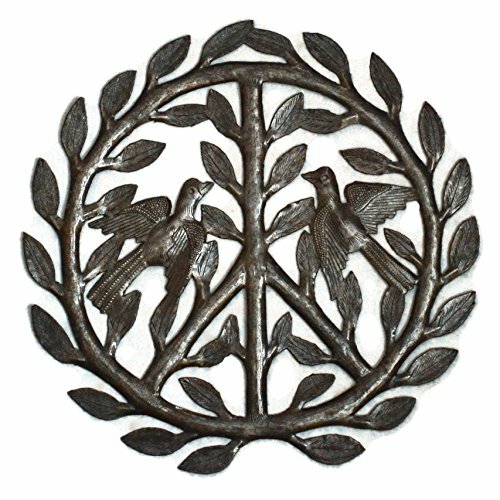 To begin, the artist chalks his design onto the metal. Chisels, dies and a large hammer are used to cut and shape the piece, giving it form and texture. When the highly intricate and physically demanding work is complete and the artist is satisfied with his work, he signs his name boldly with a small chisel and applies a clear, weather-proof coating. 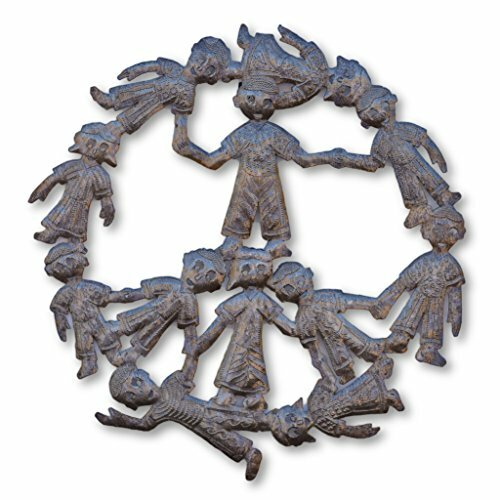 The result is a wonderful, fair trade piece of handcrafted art. 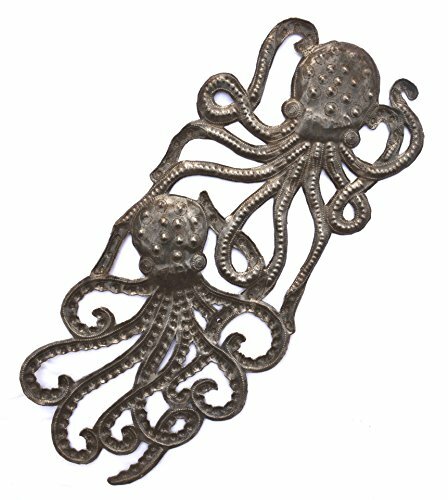 Haitian Metal Art - Octopus - 7.5"x 17.25"
it's cactus - metal art haiti Peace Sign Haitian Metal Recycled Outdoor Art Wall Sculpture, 12" x 12"
In the village of Croix-des-Bouquets, Haiti, the air rings with the sound of metal banging against metal. Workshops line the streets of the village and outside each are stacks of discarded 55-gallon drums awaiting transformation. To begin the process, the tops of the barrels are removed and the open barrel is stuffed with straw and dried banana leaves and then set ablaze. This burns out the residue and old paint and strengthens the metal. After the barrels have cooled, they are slit down the side, pried open, pounded flat and sanded down, giving the artist a smooth flat surface, much like a painter's canvas. The artist chalks his design onto the metal and then, using a hammer and chisel, begins the work of cutting the sculpture and giving it form, detail and dimension. When he is satisfied with his results, he pounds his signature onto the sculpture and seals it with a protective, weather-proof finish. Worried that this sculpture may rust? Don't be. 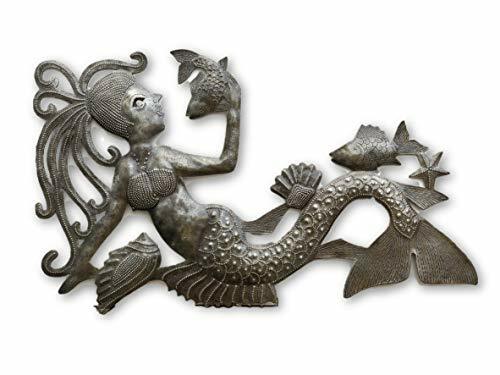 A weathered patina isn't necessarily a bad thing, but if that's not the look you're going for, take five minutes to apply a spray-on clear coat enamel once a year to keep your outdoor sculpture looking the same as the day you bought it. Delicately perched on her bicycle, this young girl has been to the market and is bringing home fresh fruit for snacking. Fun gift for farmer's marketers and bike riders - even if the gift is for you! Size: 9" x 16"
Perfect for indoor or out!. Made with only his hammer, chisel, and imagination! Garden art for your patio. 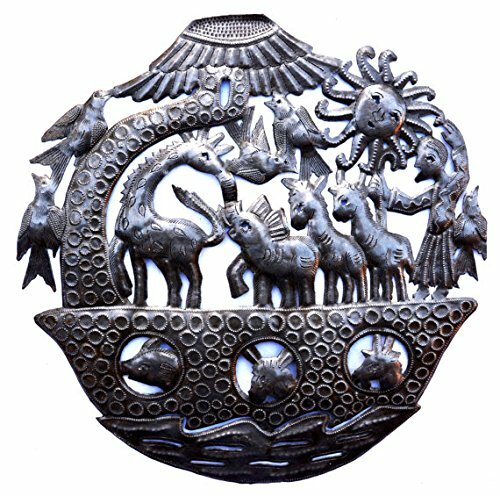 Outstanding Haitian art designs from hand cut 55 gallon steel drums. 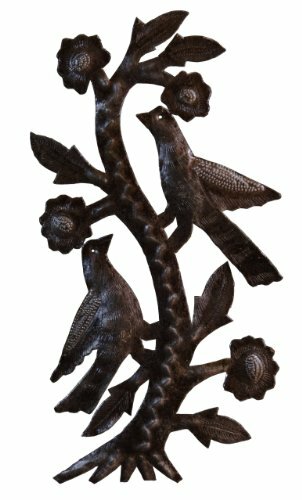 One set includes 2 birds. It's Cactus is a proud member of the Fair Trade Federation. Size: 6" x 5.5"